On this sunny Sunday afternoon, I began two plein air watercolor sketches, blending Prismacolor watercolor pencils with Winsor & Newton pigments. The 97-degree temperature tested my patience. I took reference photos of both locations and decided to finish them inside my air conditioned studio. This is the turret that sits atop Haltom’s Jewelers on Sundance Square in downtown Fort Worth. I am looking forward to rendering the knight in shining armor, standing in the enclave. The building was originally for the Knights of Phidias, so I was told by a tourist passing by and noting my work. The fellow was visiting from Lowell, Massachusetts, Jack Kerouac’s hometown. I enjoyed my visit with him. Ninety-Seven degrees on September 25 doesn’t add up to a perfect outdoor Sunday in my book. 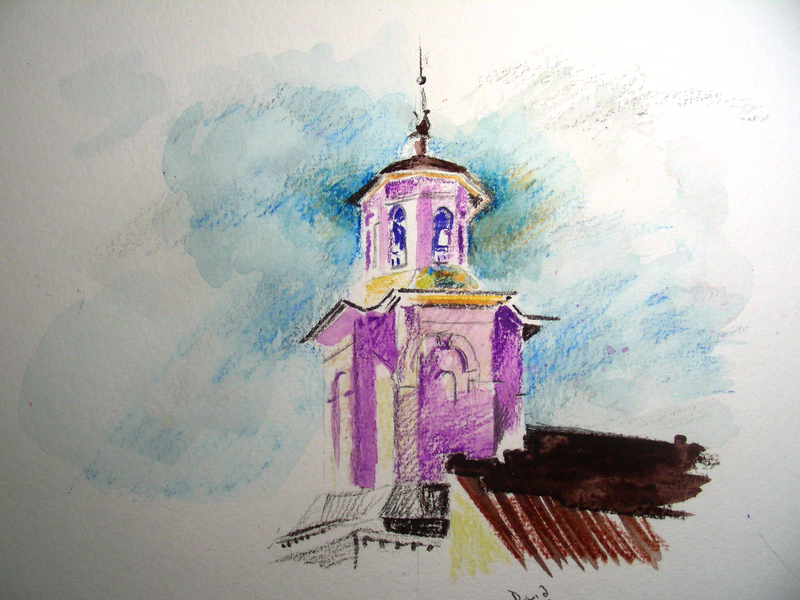 But I did step out this afternoon and attempt some plein air sketches with my new Prismacolor watercolor pencils. I’m excited to learn that the historic Ridglea Theater on Camp Bowie Blvd. is going to be restored to its pristine glory. I saw Casa Blanca on its 50th anniversary in the main theater here, as well as my first Coen Brothers film Miller’s Crossing and A River Runs Through It. I have many grateful memories of this place, and am glad that it will re-open. I’m not finished with this sketch. The hot temperatures got to me, so I decided to photograph the theater and finish it in the studio hopefully soon. Alas, I did not manage to begin a new watercolor today. I try to start something new and fresh daily, but this day was given to matting, shrinkwrapping and labeling watercolors for the upcoming art festivals. I will be participating in four art festivals over the next five weekends (not this weekend, fortunately). I found a closet-full of forgotten work that never had been matted, so there went my day. I still have plenty to mat tomorrow as well. As an artist and educator, I take delight in these sentiments. The world’s eye (through the media) remains focused on individuals who sometimes create and heal, but oftentimes spread destruction across our world. But in the quieter corners of this environ are souls who actually try to create, heal and thereby leave this world in better shape than they found it. I don’t pretend to be one who does great things. But I do take satisfaction in knowing that over the past 2 1/2 decades I have tried to grow students’ minds to think better, more responsibly, and to instill a sense of pride and ability to create a better world than the one that greets us. At this juncture in life, I am certain of fewer things than what I thought 2 1/2 decades ago. But I do possess a renewed resolve to create images reflecting the better parts of my daily environment. The image posted above was one I captured early one morning in Eureka Springs, Arkansas last June. I had risen at sunrise and descended to the lowest parts of that sleeping town, and came across this abandoned structure that exuded so much charm and beauty in the morning light. 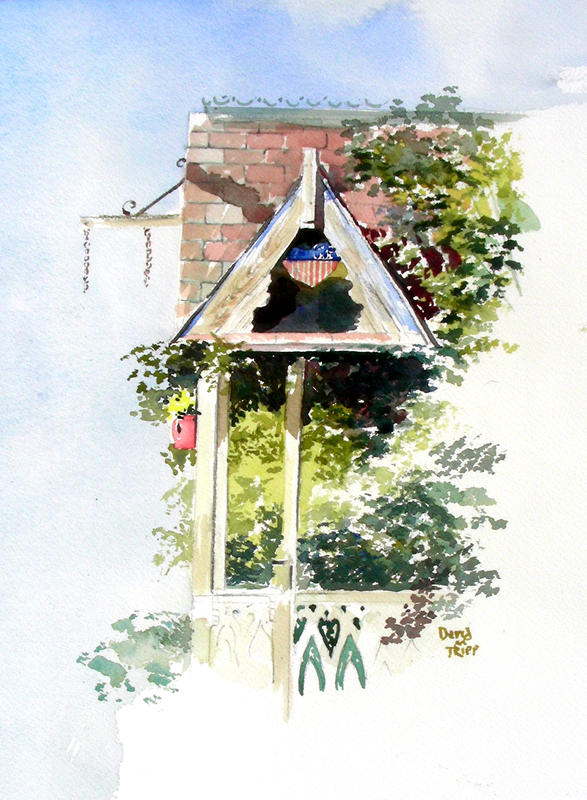 As I worked on it in watercolor en plein air, I kept wishing that I had studio space inside! I pictured how lovely it would be to step out on that porch with a cup of coffee and say “Good Morning” to a world full of promise, a world waiting to be healed, a world waiting to be re-made in a better image. To me, mornings that begin with making art are better than mornings that do not. Hopefully I can create a better morning tomorrow. Thanks for reading. 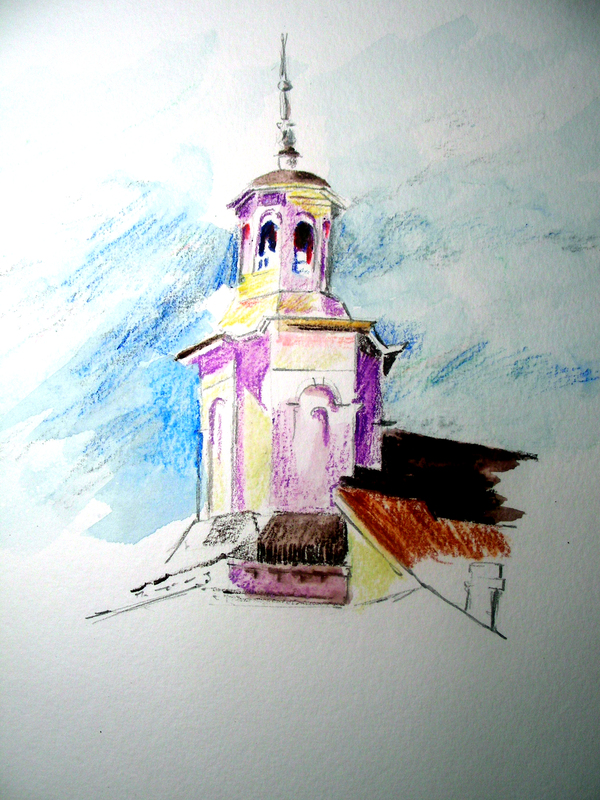 This is my second quick watercolor pencil sketch of the Provincetown Methodist Church, using as a model a watercolor Edward Hopper executed in 1930. As yesterday, I attempted this one in a matter of minutes, with Art I classes buzzing about me. The students were good, but it was hard to focus on this, when my real responsibility was to direct the students and “be there” for assistance in whatever way necessary. Still, I enjoyed the stolen moments of playing with Prismacolor watercolor pencils and exploring their qualities. The weekend is approaching. I have no hard-set plans, so perhaps some quality time will yield itself for further study and exploration. 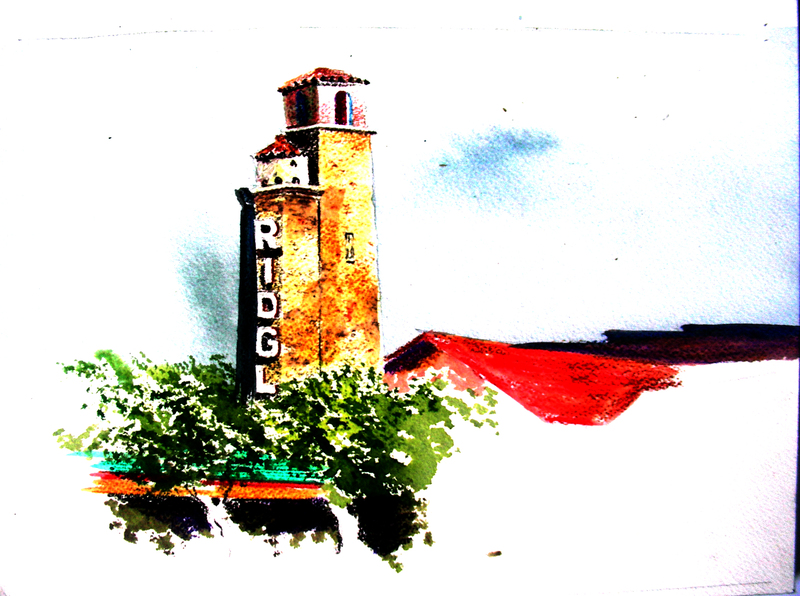 The Texas temperatures are cooling, and that means more opportunity for plein air activity. I’m looking forward to that. My next art festival is about nine days away, so I have a little time to make art. Quality time for art work today was near-zero. Another lousy public school day–too many classes and responsibilities and bureaucratic crap to tend. Tonight was a grading night till near midnight. I will rise at 5:00 tomorrow morning, as I did the last two mornings, for no other reason than catching up on school responsibilities. During a lull in one of my classes today, I attempted a super-quick rendering of this, taken from Edward Hopper’s 1930 watercolor of a Methodist Church in Provincetown, Massachusetts. He accomplished this feat from the backseat of a Dodge, somehow folding his 6’5″ frame inside that small space, and balancing a vertical 25 x 20″ watercolor page. At least I had the luxury of standing at a teacher’s desk. I used Prismacolor watercolor pencils exclusively on this quick study. I’m trying to open up another avenue of watercolor exploration, working only in watercolor pencils, and avoiding the Winsor & Newton tube paints or cakes from my plein air hand-size palette. I’m still trying to get used to the new experience, and feel that this is the best of my pieces in the past three days. I only have 20 minutes total invested in this one, and think that if I could give one, uninterrupted hour to an endeavor such as this (I think I never got even 5 minutes of non-interruption on this one), that I could crank out something halfway decent. I’m starting to get a feel for the pencils on architectural details. Who knows, maybe tomorrow? I wouldn’t bank on that. Tomorrow I have 4 classes in 4 classrooms on 2 floors–worse than today’s ridiculous schedule. So, why am I doing this? For a number of reasons. One: school this year is a farce. I have an assignment to teach four different subjects, and every-other-day I have to change classrooms with every bell. I’m not a pediatrician who is able to stroll briskly from one examination room to the next, keeping separate the prescriptions and diagnoses of male and female children from infancy to pre-teen. I just cannot do that the way I did twenty years ago. My brain is scattered and I’m having problems keeping the disciplines of Art I, Advanced Placement Art History, Regular Art History and Philosophy flying in proper, linear formations. Aside from the teaching there is the grading, accountability, attendance, disciplinary and intervention issues. How could any administration, locally or statewide, really believe such a feat possible? And this will last the entire academic year. Two. My passion now is to make art. I used to live for the classroom. My heart used to beat for the classroom. Posturing politicians and political administrators managed to kill that for the time being. Right now, making art matters to me, not crossing all the “t’s” and dotting all the “i’s” for administrative, vacuous political paperwork and bureaucracy. Three. For the past several years, the issue of productivity has weighed heavily on me as a practicing visual artist. I finally realize that talent doesn’t matter. If one doesn’t produce, who cares if s/he has talent? If one does not make art, who cares about his/her aesthetics or theories? No one. If an artist is going to be authentic, s/he has to be prolific. I used to average 10-15 watercolors a year, and used my school job as an excuse. I didn’t have time. I made a New Year’s resolution in January 2010 to create 30 watercolors by year’s end. I made nearly 100. I have not bothered to count the watercolors of 2011, but one day I will. Maybe I will not reach 100, but I certainly have made more than 10-15. Sometimes I average one a day. Many times I average one a week. Large 20 x 30 compositions I have managed to complete in less than two weeks. I am now making art more than ever before in my life, and in that I do find a genuine delight, even if the world around me crumbles. This is one thing over which I can exert control. I’m inspired when I learn that Bach wrote a cantata a week, in the service of the church. Some of them were not that good, but he still produced. I learned that Jean-Paul Sartre and T. S. Eliot and Ezra Pound were capable of churning out unheard-of numbers of manuscript pages per day. And yes, some of the work was sub-standard. But they produced. Artists produce plenty of good work along with plenty of bad work. But they produce, period. Four. The blog. This daily exercise in blogging keeps me working in the enterprise of making art. I feel an accountability. Though I’m not a copy editor of a newspaper facing daily deadlines, I do feel the interior deadline of the blog, daily, and have for a long time. When I don’t put out a blog for the day, I feel that I have not turned in my homework. I feel that I have not completed my 40 hours for the week. The blog is always there. I’m grateful for all my subscribers, for all my daily readers, and for the wonderful network connections that continually find ways to fling my words and images out before an audience. And so, I continue to make art to feed the blog. Five. 10,000 hours. That is the magic number from Malcolm Gladwell’s Outliers. It takes 10,000 hours of practicing one’s craft to achieve excellence. This is a fascinating book. I don’t know if I’ve turned in my 10,000 hours, but I’m conscious that I will not improve on my art if I don’t repeat the practice, the discipline, and at the same time push myself in new directions, flexing aesthetic muscle. And so I keep at it, and this is a Quality part of my life right now. Thanks always for reading. Today, while Art I students were busy with their collage experiments, I made a couple of attempts to sketch in watercolor, using only Prismacolor Watercolor Pencils. Naturally, I couldn’t focus the way I wished, with 25 students buzzing in the same space as I, but I enjoyed this effort nevertheless. I only discovered this product this past summer while teaching at the Eureka Springs School of the Fine Arts. I purchased a fistful and used them to finish out a number of plein air and studio watercolors created over the past four months. But I have never used them exclusively. I’m used to blocking in large areas with Winsor and Newton pigments, and occasionally reaching for the Dr. Ph. Martin liquid watercolors. I’m still struggling with how to block in the larger areas. 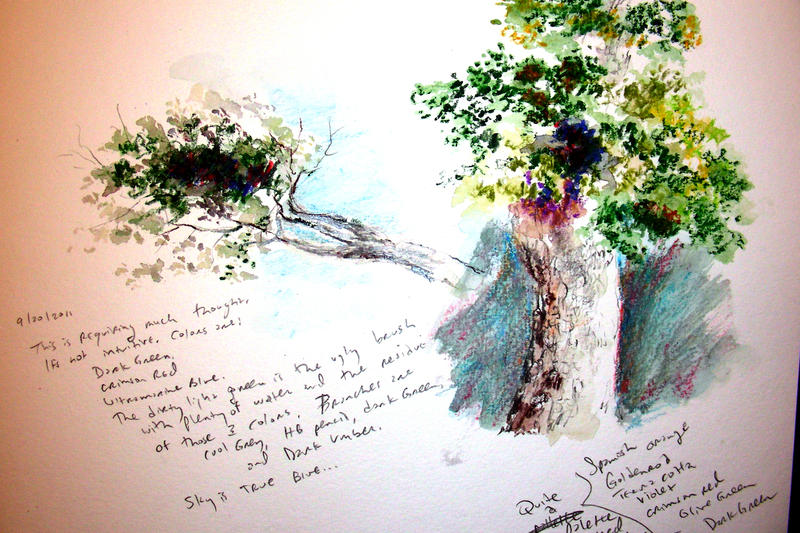 I struggled somewhat with the sky portions and the ground neutrals of the tree bark. But again, once I’m alone in the studio, I’m sure I’ll be able to concentrate better. I think I’m going to enjoy this new foray into watercolor experimentation. I’m feeling too settled right now for my own satisfaction. It’s time to return to the studio. Unfortunately, I have a cursed 4-class high school load today, followed by a meeting, followed by a workshop, followed by preparations for tomorrow’s classes. Maybe I’ll see the studio by midnight. The Fort Worth Music Festival is two weeks away, so I’m dusting off my music subjects. 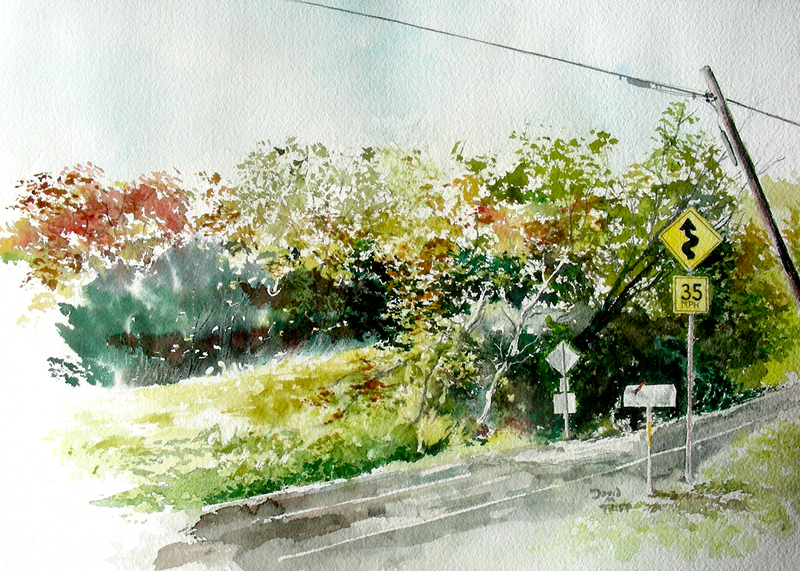 This watercolor was completed in the summer of 2010, then promptly stolen. Fortunately, I had a photograph made, so giclee prints are now available. 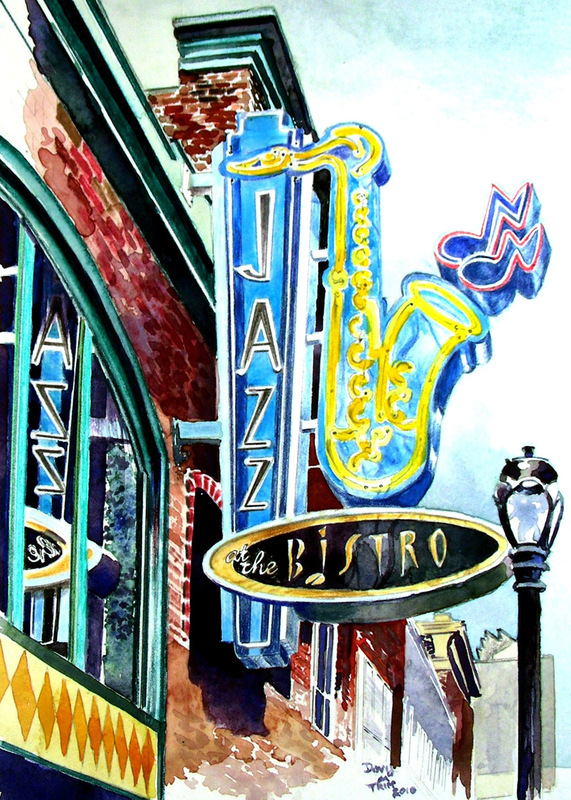 Jazz at the Bistro is located in St. Louis, just around the corner from their historic Fox Theater. The cool blue hues of this facade, to me, reflected cool jazz, and I couldn’t resist a watercolor of the subject. I’ve been asked recently to work on some watercolor compositions, using Prismacolor watercolor pencils exclusively. This particular painting made heavy use of Prismacolor pencils over my Winsor and Newton watercolors. This week I plan to do some experimenting with Prismacolor watercolor pencils, a first for me. 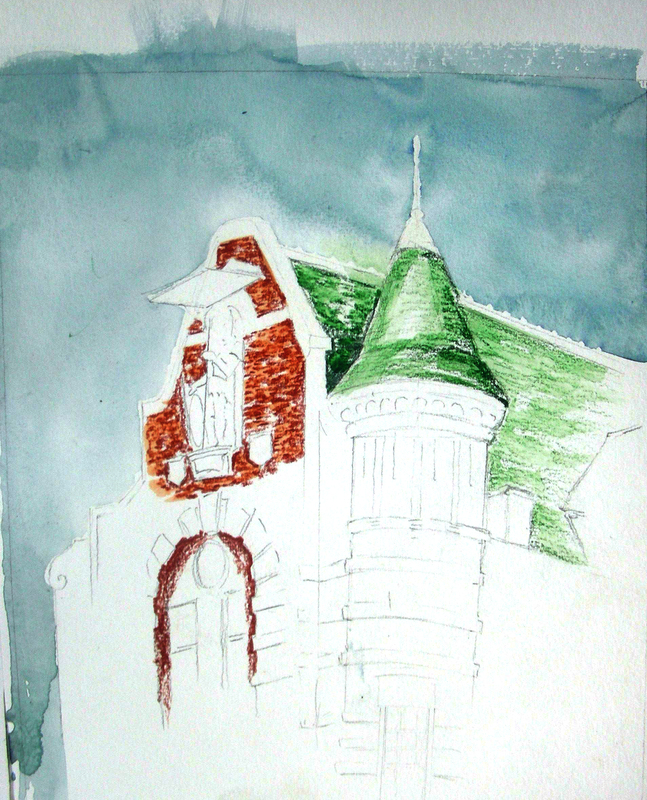 Tomorrow, I hope to begin a series of watercolor sketches at various Fort Worth locations. I need new material for the various art festivals coming up the next two months. The cool, autumnal temperatures that lightly kissed the four-day Grapefest have left me yearning for the changing colors that announce the plein air season for passionate watercolorists. Though the art festival season will be extremely heavy from September through October, I am of a mind to commit my weekday afternoons to plein air watercolor sketching. This is an open meadow across Business Highway 287 on the north side of Waxahachie, Texas. I had stopped by Zula’s Coffee House late one autumn afternoon in 2010, and enjoyed my coffee outdoors at a picnic table while watching the sunlight sweep across the field across the highway. I took out my watercolors and made quick work of this vista. Now I’m ready to chase autumn colors with the brush again. They cannot come soon enough. 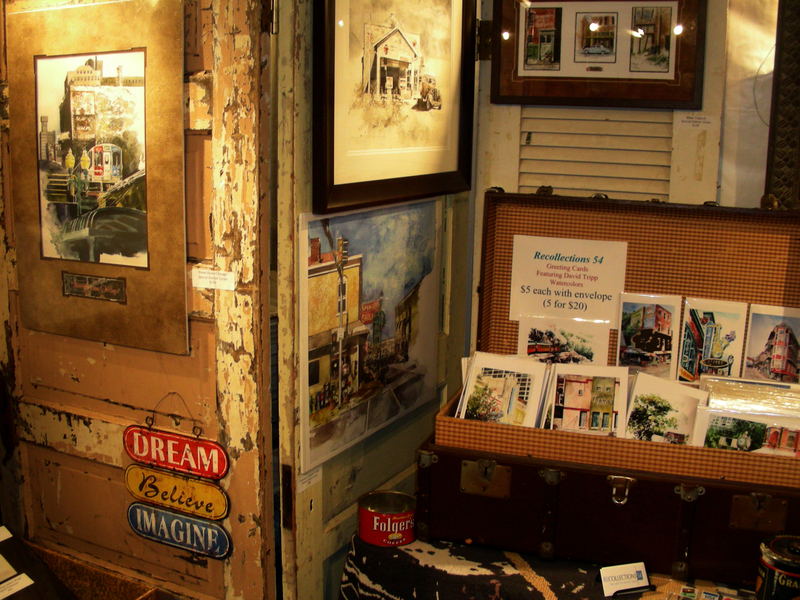 As I write this, I’m nearing the close of the third night of a four-day art festival. This is a first for me, and I must say the thirteen-hour days are taxing. I’m quite numbed by all of it, though sales this evening have been brisk. I had to close the book and take a deep breath, I was so rocked. I call my company Recollections 54 because it marks my birth year, and the objects in my present day-to-day landscape which hold me are the ones that conjure up memories of my childhood in the late 1950’s. As Proust has consistently recorded in his literary masterpiece, our senses take us back to childhood memories that are worth remembering. The beauty of today was grounded in shared experiences as patrons viewed and purchased my watercolor compositions, and shared their memories with me. Currently a big BIG rainstorm is pouring over Grapevine, Texas, forcing festival patrons indoors. My booth has remained intact and dry (I’m grateful for that!). 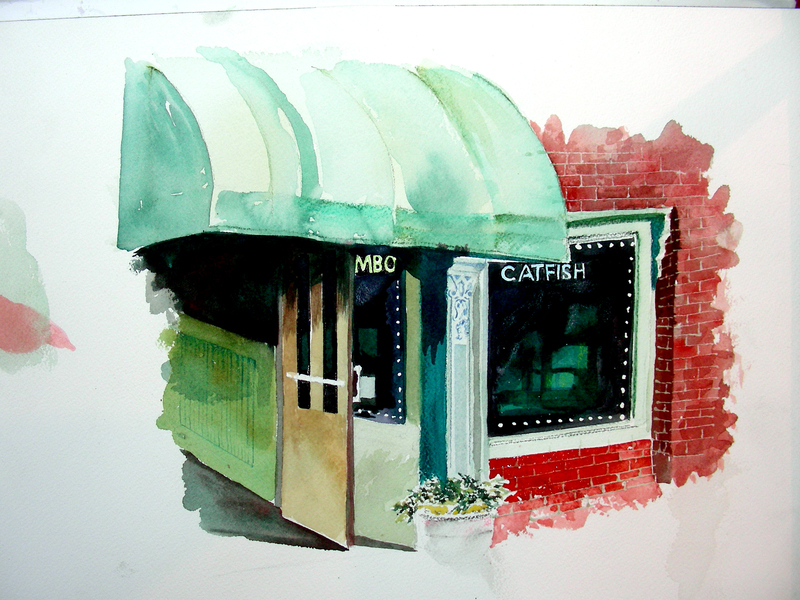 Meanwhile, I finished this plein air watercolor sketch of Big Fish, a popular seafood restaurant on Main Street in Grapevine. Thankfully, my booth is positioned right in front of it, so I’ve had plenty of time for my eye to linger over the facade and take in its essence, so to speak. I love the complementary relation between the green woodwork and the red brick that graces this structure. This has been a fun sketch, and the sales today have been O.K. Better than yesterday. The patrons have been fabulous and I have so enjoyed the conversations and exchange of information. I feel that I’ve made so many new friends (and perhaps gained some new patrons as well).